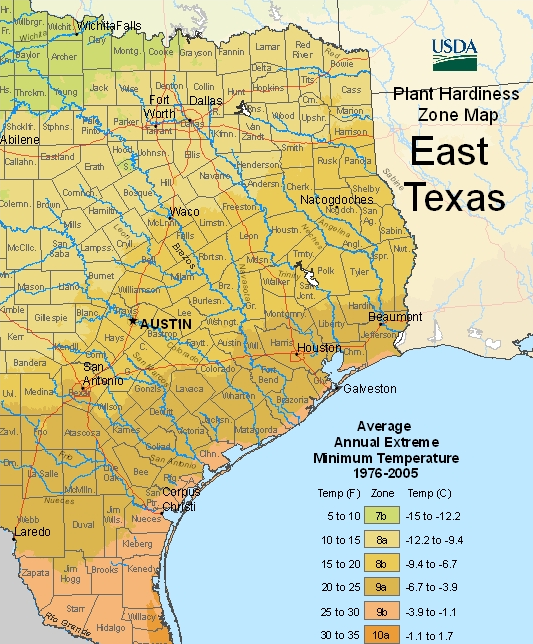 The USDA announced changes in plant hardiness zones this week, moving San Antonio into the same planting zone as Houston and Corpus Christi while Austin, Dallas and Houston zones remain unchanged. The backsides of seed packets will never be the same. The new map reflects 30 years of temperature data, from 1976 – 2006, and includes 26 specific zones, each with a five-degree temperature differential. For example, San Antonio moved from zone 8b, with annual lows of 15 – 20 degrees, to zone 9a, with annual lows of 20-25 degrees. Of 34 cities listed on the key of the map, 18 have new zoning designations. The new maps employ useful new interactive GPS, whereby you can plug in your zip code and find out your zone. The data also reflects microclimate effects like nearby water sources and elevation. The redefined heartiness zones tell us what butterflies and blooms have been communicating for the past few years. As Monarchs and other butterflies reproduce on the San Antonio River well into the winter, it’s apparent that it’s just not as cold as it used to be. Like what you’re reading? Don’t miss a single post from the Texas Butterfly Ranch. Sign up for email delivery in the right navigation bar on this page, like us on Facebook, or follow us on Twitter, @butterflybeat. Placing San Antonio in zone 9a was a mistake as temperature have been dropping into the upper teens still. ( 2010, 2011, and now in 2014). I already new this but this can be misleading to new gardeners here. Hi. It’s me again-Vanessa on the hill. I forgot to say I just your article the indicated San Antonio has moved from an 8b to 9a temperature zone. My hill is located in that zone – north San Antonio. Hope you can offer some good suggestions. Hi. Just getting started on landscaping ideas and projects. I have few ideas, no projects and little to no money at the time. However, I just saw a news report on the disappearance of honey bees. At the end, when asked what can we do to help, the expert said we should plant native vegetation. So I’m willing to do that. So just a few questions: 1) I live on a hill (@20 degree pitch/angle), no fencing thus deer roam freely. I want to plant natural vegetation that won’t get eaten up by the deer, fend off hill erosion, and will help the honey bee population. What are some good low cost, LOW MAINTAINENCE (I’m on a hill) types of plants I could use? 2) How does native vegetation promote growth in the honey bee population? Thanks.